I have been incredibly fortunate with the interview opportunities available thanks to my "blogging dayjob" as an interviewer for Pop+Nation. One such opportunity came recently with the chance to interview Swedish 'Idol' star Agnes, who is in the preliminary rounds of serving her breakthrough hit "Release Me" to the US. It's already making waves on the Billboard Dance Charts, and is looking to make a dent in the Hot 100 in early 2010. 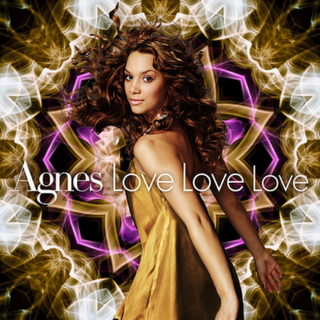 Below are the questions I got to ask Agnes, however, the interview was done in conjunction with my friend Nikki of Pop Reviews Now, so click here to read the interview in its true entirity. Not only is she a fellow Agnes fan, she was the one who introduced me to this incredible new pop vocalist. Read on to learn a bit more about Agnes. The interview below is how it was sent to us at Pop+Nation, capslocked and all. "Release Me" is beginning to generate serious buzz in the United States Club/Dance Market. Are there any immediate plans to begin breaking into the United States in a more mainstream way? Will you be releasing "Dance Love Pop" as is or with new material? OF COURSE I WANT TO MAKE IT IN THE US. NEXT WEEK I WILL GO TO THE US FOR A LOT OF PR. SO I AM REALLY EXCITED. THERE WILL BE NEW MATERIAL ON THE ALBUM RELEASE. Your most recent album has received a lot of positive media praise, with comparisons to some of pop music's greats like Madonna and Whitney Houston. Who do you feel in this genre personally inspires you most? I HAVE LISTEN TO WHITNEY HOUSTON MY WHOLE LIFE AND I LOVE MADONNA. I THINK THAT MY MUSIC IS SOMETHING NEW THOUGH. You have now performed all over the world. Aside from your home country of Sweden, where have the crowds been the craziest so far? THE FANS ARE GREAT EVERYWHERE AND THEY GIVEN ME A LOT OF ENERGY. What is one thing about your personality that most of your fans wouldn't know? I ACT ACCORDING TO MY FEELINGS. You've accomplished so much and are yet so young! Do you have any words of advice for young women attempting to break in to the music industry? IT IS VERY DIFFICULT TO GIVE ADVICE AS PEOPLE ARE DIFFERENT. BUT PRACTICE A LOT AND ESPECIALLY YOUR PERFORMANCE ON STAGE. How important do you feel it is to be a role model to young women? I AM ALWAYS MY SELF AND I UNDERSTAND THAT THATS THE REASON WHY PEOPLE LOOK UP TO ME. I AM HONORED BY THAT.